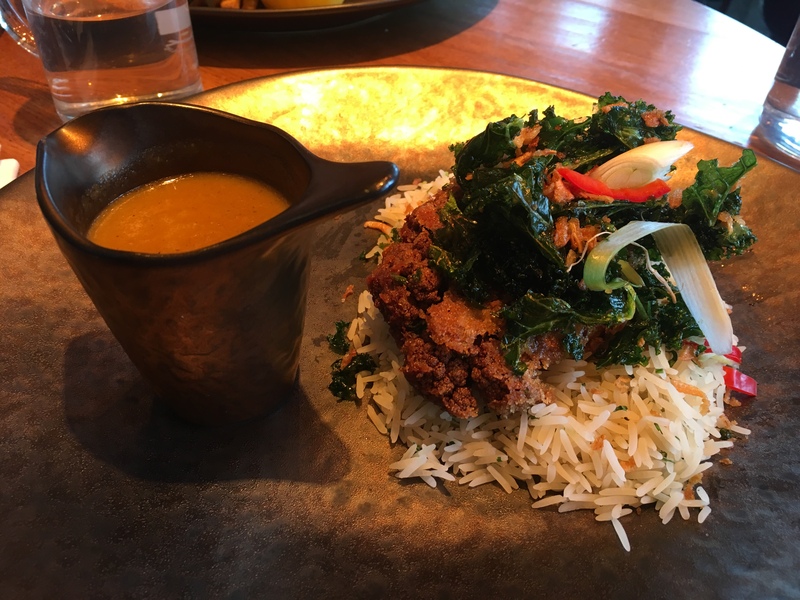 Taking advantage of The Alchemist‘s brilliant January offer of 50% off food, my boyfriend and I visited on a Sunday lunchtime and decided to go all out. The main appeal for many who visit is certainly the large amount of theatrical cocktails and drinks on offer, but I had been eyeing up their food for a while. The menu features a number of clearly labelled and delicious sounding dishes, so I was excited to go and try as many as I could justify sinking my teeth into in one sitting. On first impressions, the service was really welcoming, warm and attentive (admittedly we’d been to Frankie and Benny’s the previous day who had set the bar particularly low). The small restaurant was nearly full and we were seated at a cosy table for two with lots of light coming in from the big windows looking out onto the terrace – there are outside tables too and during summer I bet it’d be gorgeous to sit out, though they’re not bookable and offered on a first come first served basis so I bet they fill up pretty quick. I’m not much of a drinker so I took a look at their mocktails, thankfully narrowing down the extensive list of options as I’m really bad at making decisions. I asked the waitress which ones were vegan and she was happy to check and point those out, so I went for the strawberry colada. As a student, I loved pina colada until one regretful incident which has left me unable to stand the smell of one. With the promise of the strawberry though I thought I’d give it a try and I’m happy I did because it was delicious. 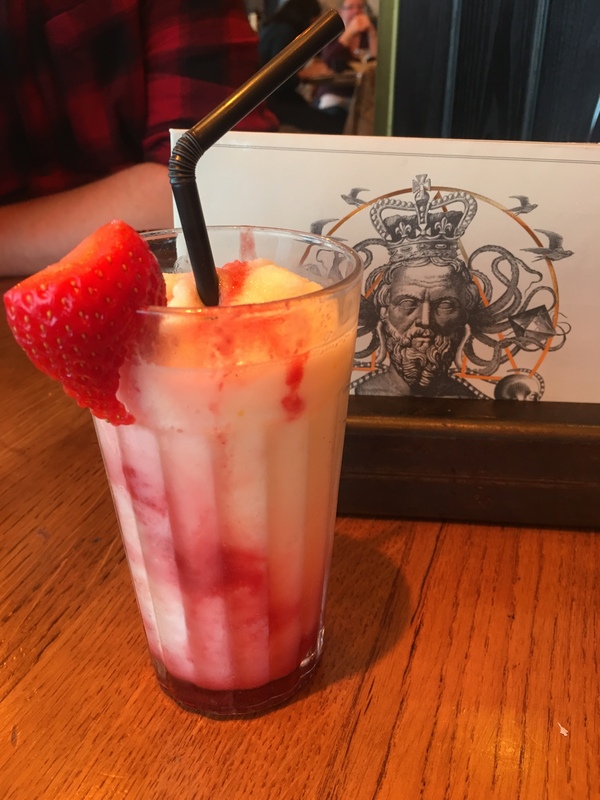 It was like a cross between a grown-up slush puppy and a coconut milkshake, super sweet and all too easy to finish up quickly. I often just order tap water at a restaurant as drinks fill me up and I prefer to save more room for the food, but this didn’t leave me feeling too full and it would’ve been kind of worth it if it did anyway. To start, I ordered the vegetable gyozas, which often frequents menus as the vegan starter. 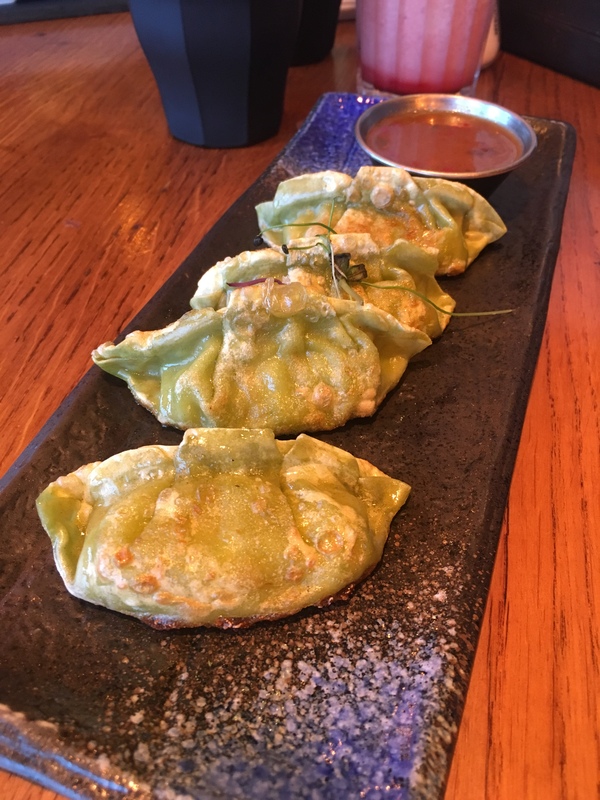 Four delicate green parcels were served on a hot slate with a dipping sauce. They were soft and had more flavour than some gyoza I’ve eaten in chain restaurants but what really brought this to life was the dip, slightly sweet and sour and adding a chilli kick to the dish. Jamie pinched some of it too to go with his starter, the seitan nuggets, which sadly aren’t vegan (a quick look at the allergen menu suggests that’s down to what they’re coated and fried in – come on The Alchemist you gotta fix that, it’s an easy win)! Overall the starters were very enjoyable and filled me with hope for the rest of the meal. At this point, our waitress came over to tell us she was going on her break and to introduce us to our new server which I thought was a nice touch and our mains didn’t take too long to arrive. I’d ordered the poke bowl which was presented beautifully and looked really vibrant. 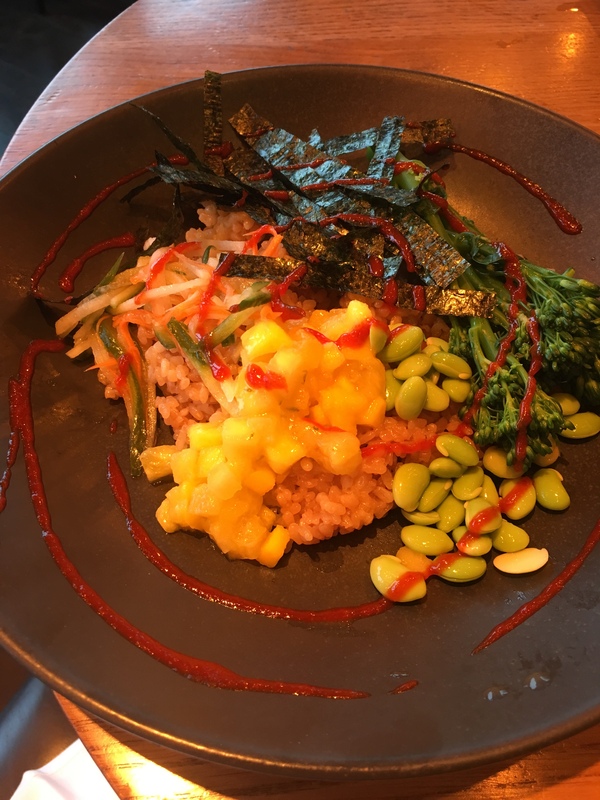 The sesame rice wasn’t too heavily salted, with a hint of soy and it was balanced out with the freshness of a handful of edamame beans and sweet chunks of mango. The contrast of sweet and salty was spot on, and you also had a nice heat coming from a squeeze of sriracha. There was some well-cooked broccoli and a generous handful of nori for that flavour of the sea. A poke bowl is not something I’d usually order but I was happy that I did. Being particularly greedy and having the 50% off we decided to order a third main between us, the Vietnamese banh mi baguette. It’s in the ‘to have and to hold’ section of the menu which seems to be more for lunch-y options rather than dinner. 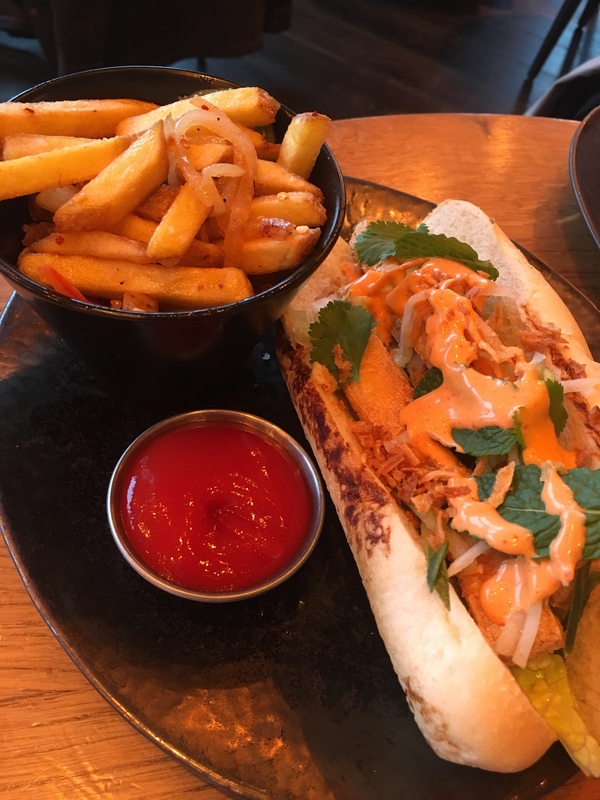 The fairly large, soft baguette was filled with slices of fairly plain tofu, lettuce, crispy onions which added a nice crunch, and sriracha mayo. A handful of fresh mint lifted the baguette, though it could’ve done with a bit more sauce or seasoning to make it exciting. The skin-on fries on the side however were particularly delicious. They were crispy and hot on arrival, and were topped with a cooked onion and pepper mix for something a little different. The taste was wonderful, though I’d recommend either tipping them out their bowl or eating them up quick (probably not too much of a challenge) as liquid released from the veggie topping made the bottom chips go a little soggy. I know that many vegans feel, like I when it comes to sorbet, that rice pudding is a cop out vegan pudding. I do actually really enjoy rice pudding though, and in keeping with the drinks menu at The Alchemist, this bowl of dessert is definitely not your ordinary rice pudding. It sounded intriguing on the menu and when it was put down in front of me it looked probably more interesting than I could’ve expected. 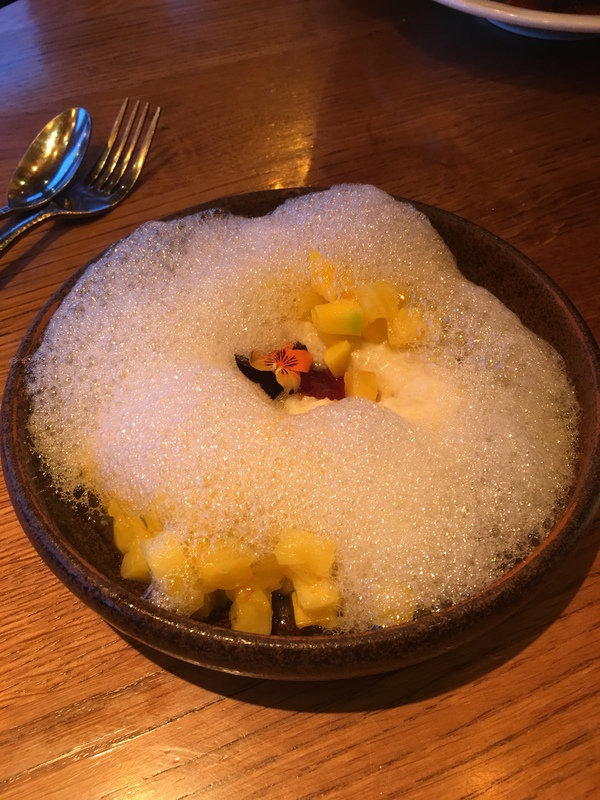 The thick coconut pudding was topped with a chilli lime foam, which despite being mostly air added a kick to proceedings – nothing too intense but kind of at the heat level of a fiery ginger. I love mango so I didn’t mind having it across two of my courses, and the little chunks gave a freshness to the dish so that it wasn’t too stodgy. I enjoyed the showmanship of the dessert and it was a nice sweet end to a great meal. Even without the 50% off (after all it’s really not necessary to order as much food as we did) I think it would’ve been a very reasonably priced meal. In fact, I enjoyed it enough that I booked a table for a couple of weeks later to eat from the menu full price. This time I went for the cauliflower katsu, and as before it arrived very quickly and presented very nicely on the plate. It was definitely different from the thick, stodgy katsus I’ve had from chain restaurants before (don’t get me wrong though, I still enjoy those). The rice was free-flowing, and there was just the right amount of sauce. The cauliflower added a nice bitterness in contrast to the sweeter curry. It felt fresh and healthier thanks to the crisp veggies on top too. All in all another very pleasant meal. The Alchemist has a lovely atmosphere to enjoy a nicer meal out, without breaking the bank, and know you can expect great service too. Have you been for drinks or a meal? What did you think? Let me know in the comments!